Let’s talk about ketchup for a moment. I mean, has anyone besides me noticed that when you go to restaurants these days the ketchup is not as free flowing as it once was? Those aesthetically pleasing bottles of red velvety goodness, 57 raised on the glass, reminding you of the perfect place to tap on the bottle and release the thick tomatoey goodness? No longer just sitting on tables! The explanation: “It’s right there on your plate.” Really? Apparently I need a magnifying glass to spot the ketchup, so could you just kindly bring me another? The look of confusion: eyebrows raised and the I-don’t-understand-what-you’re-talking-about look. And I’m like, K-E-T-C-H-U-P. Bring it. Chop-chop. And then what do they bring? Yep. 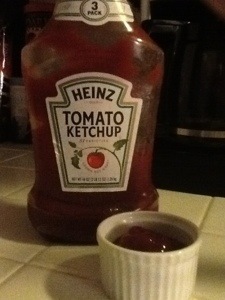 The micro cup of ketchup. And on it goes with my ketchup requests. So is there a ketchup shortage? The 185,000% mark-up on your sodas not paying off these days? Look. The thing is, my expectations these days are not all that high when it comes to the restaurant dining experience. Just today, it took nearly the entire meal at lunch for the server to bring me a glass of water (seriously!). She brought one half way through the meal and it turned out the glass was cracked. When she came back around I pointed it out. She claimed to be horrified and said she would bring me a fresh glass right away. Tick… Tock… Finally, she came to bring the check and asked if we wanted anything else. I said, “Yes… could you bring me a glass of water?” She said, “certainly,” then left and returned with a glass of water. No apology, no acknowledgement of her error, zip. So, poor service, incorrect orders, ignoring me while I’m sitting there waving my menu at you because I’ve been ready to order for twenty minutes–I’ve come to expect all that. Now, all I’m asking for is ketchup. Not an explanation. Not a look of profound confusion. Ketchup. I know you have plenty of it back there behind the counter, so why are you hoarding it? Sometimes I just don’t get it. This entry was posted in The Human Side and tagged food, ketchup, ramekin, restaurant, service. Bookmark the permalink.